Then, click on the drop-down menu of settings. 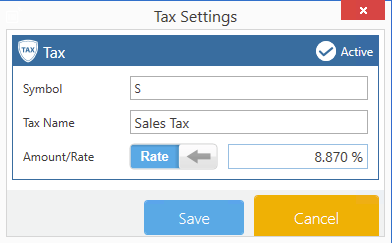 In the Tax Settings window, Click on the blue plus icon. Enter the Symbol of the tax. For example: if you're creating a sales tax, you can enter S as the symbol. Enter the name of the tax in the name field. Enter a fixed or percentage amount by toggling the rate/fixed button. Make sure the tax is active.